Scorsese's latest movie Shutter Island is a very interesting film and it’s one of those films which boast a very large secret. Originally I saw this film at the cinemas and needless to say, it did leave me quite impressed, although I saw the ending coming towards me like a freight train. Not only is Shutter Island cleverly written but it contains a great cast that is led by Leonardo DiCaprio who plays U.S. marshal Teddy Daniels. The story is also based on the novel by Dennis Lehane which Scorsese truly embraces and creates a grim noir crime mystery with a healthy dose of psychological madness. Set in 1954, Daniels has been assigned with his partner Chuck Aule (Mark Ruffalo) to investigate the disappearance of a patient Ashecliff Sanatorium from a mental institution for the criminal insane. We also learn that this patient Rachel Salando murdered her own three children, hence her institutionalisation but somehow has she mysteriously vanished from her secured room with no witnesses on this remote island. The island is situated off the coast of Massachusetts which is an unescapable fortress which uses (apparently) some questionable techniques with mental health. From his very first steps on Shutter Island, Daniels gut instincts as an investigator sets off alarm bells due to the odd behaviour of the staff and some of the residents of this mental hospital. To make matters worse, Daniels believes that the institution is hiding more information about the disappearance of their patient and that there are more patients than they are led to believe. Upon further investigation, Daniels theorises that psychiatrist Dr. John Cawley (Ben Kingsley, Species) is behind the disappearance of Rachel and he may have links to Nazi collaborators. This is where the catalyst begins and during a violent storm, Daniels is given some medication by the staff of Shutter Island and from here, an entire collection of reprised memories are unleashed which makes him question his own sanity. Without spoiling the movie, Shutter Island is truly an impressive journey into the psyche of man which creates a true psychological roller coaster ride. DiCaprio is brilliant as Daniels, a man torn between reality and fiction but unfortunately Ruffalo seems a little under utilised in this movie. To compliment the stellar acting by DiCaprio, Hollywood legends Ben Kingsley and Max von Sydow only lend the film more credibility and are brilliant as the head doctors of this down right creepy establishment. It’s definitely a cast of actors who truly get into their characters, hence the end result of this entertaining and quite scary story. The video quality of Shutter Island looks quite stunning on Blu-ray and Scorsese has really captured the era of the 1950’s with the muted colours and minimal amount of lighting. The set design is unparalleled in Shutter Island, especially how they created some truly spine chilling locations from the creepy looking institution to the period costumes which is perfectly implemented into the film. 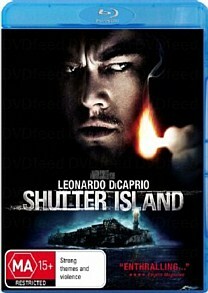 Add in DTS-HD MA 5.1 lossless soundtrack and Shutter Island sounds quite impressive through our surround sound setup and certain scenes make great use from this technology. The dialogue is crystal clear that compliments the story, especially with the engaging soundtrack. As special features goes, Shutter Island comes with two featurettes that include Behind the Shutters which features interviews with a variety of people who helped make the movie which include the cast, crew and even the author himself. The other special feature called Into the Lighthouse gives the viewer a great history on psychiatry of the 1950’s and the motivations behind the creation of this film. In the end Shutter Island was quite a memorable movie for me that features an extremely well written plot and some wonderful acting by the cast. The locales transcend the movie to another level and really draws you in from the first few minutes of the film about one man’s psychological journey for the truth and the mystery of Rachel Salando. Highly Recommended on Blu-ray!